Keystone Compliance offers temperature and temperature humidity testing in chambers ranging from small bench top to large drive-in systems. Our largest chamber was specifically oversized in design. With inside dimensions of 12’ wide x 15’ long x 10’ tall and an 8’ x 9’ door, Keystone Compliance is capable of moving, installing, and testing multiple rack assemblies. Keystone Compliance also operates a large walk-in chamber that is specially equipped with twin 30 hp compressors and is capable of temperature transition rates exceeding 15 degrees Celsius per minute. All of Keystone Compliance test chambers operate with state of the art digital temperature controllers. Every chamber is equipped with high and low temperature safety devices. Furthermore, these temperature safeties are deigned to interrupt test item power in the event of a test chamber failure. Keystone Compliance operates its environmental chambers from a single remote computer. The system is designed with redundant safeties and is capable of dialing multiple phone numbers in the event of an anomaly. Additionally, customers are able to monitor the progress of their test, with full graphical displays, from their desktop, laptop, or even from their cell phone. Keystone Compliance operates state of the art temperature and temperature humidity test chambers. Our investment into our brand new drive-in chamber is a reflection of our years of testing experience. 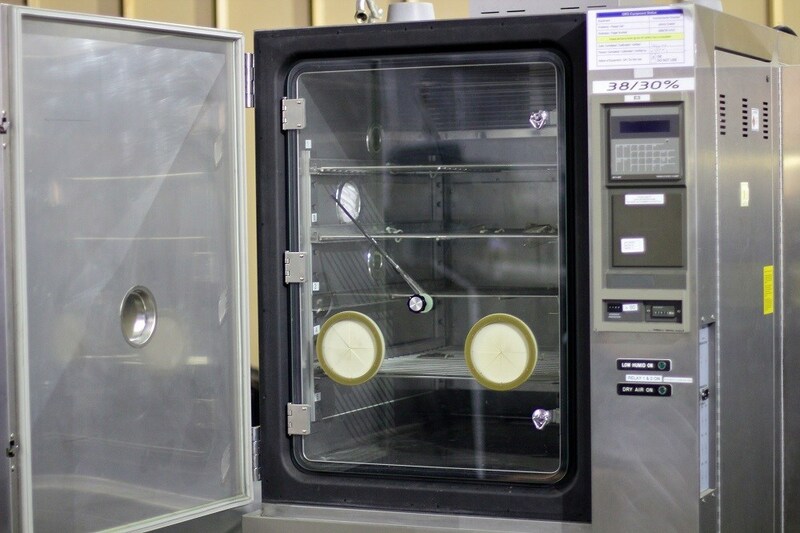 We realize that temperature and temperature/humidity tests are the longest running tests in your testing program, and we understand the importance of reliability of environmental chambers. No one ever wants to have a test chamber malfunction on the 29th day of a 30-day test program. With our investment into new and up-to-date equipment, Keystone Compliance has done everything possible to reduce the risk to your test program. Keystone Compliance operates a number of different temperature and temperature/humidity test chambers. Chambers range in size from small bench top to large drive-in systems. Temperature capabilities range from -200 to +200 degrees Celsius. Keystone Compliance is capable of building customized test chambers as needed to accomplish any environmental test parameters. Humidity testing, per MIL-STD 810 Method 507.4, introduces products to increasing levels of relative humidity to determine a product’s ability to operate in certain environments. Humidity testing will signal any design flaws that might lead to common humidity issues such as electrical failures, swelling of materials, change in surface condition, deterioration of optical equipment, corrosion, oxidation and accelerated wear on moving pieces. Humidity testing can be completed by using the direct condensation and indirect effect. Direct condensation is the formation of water droplets on a device that can cause direct damage to susceptible components. Indirect effect can vary in form but generally involves moisture reaching sensitive components that cannot operate correctly in a moisture-filled environment.